One Nation Under God: How Corporate America Invented Christian America, by Kevin Kruse: Though parts of this historical account of the rise of Christian America may seem dry to non-history-wonks, every page proved worth the effort. And in the midst of what is proving to be one helluvan election cycle, understanding the roots of religious trends in U.S. government is more important than ever. (My review, originally in Shelf Awareness for Readers; and for further reading, my interview with Kevin Kruse). H is for Hawk, by Helen Macdonald: I never found the right words to use to review this book--not because it is not worthy of many (many) words of praise, but because none of my words felt right in explaining Macdonald's. H is for Hawk lives somewhere between the world of memoir and history, a study of falconry and T.E. White's midguided time as a falconer and Macdonald's own experience raising a goshawk in the wake of her father's unexpected death. It's stunning. The Underground Girls of Kabul, by Jenny Nordberg: This was a pick in the "Our Women, Our World" book club I participated in through my local bookstore, and I was surprised by how much I enjoyed it. Nordberg's account of girls being dressed as boys in Afghanistan deals in heavy subjects--gender identity, social constructs, totalitarian regimes--but does so in a way that makes every topic feel relatable and approachable. I learned a lot about a subject I didn't even know I was interested in with this book; I'd say that's a fairly impressive outcome, myself. Yes Please, by Amy Poehler: What is there to say about Poehler's memoir but that it is one that must be read? Best consumed on audio, with Poehler narrating her own work, this ranks up there with Bossypants in the realm of celebrity-memoirs-turned-personal-essays-with-a-point. What am I missing? 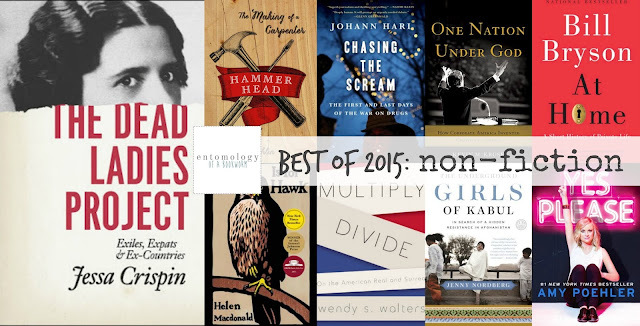 What are your favorite non-fiction reads this year? ?